(the topmost ‘relief Chamber’) in the Great Pyramid. The series of images below show that there is a ‘hidden’ cartouche below the hieroglyph inscription of the first block of the south gabled ceiling which is covered by the block underneath it. 1. Drawing by Perring c. 1837: The South gable ceiling in Campbell’s Chamber. HAWASS and the “EDGAR CAYCE” PEOPLE. In 1996 Hawass, the Director General of the Giza Pyramids, helped two senior life-members of the Edgar Cayce Foundation (ECF) obtain a five-years renewable exploration permit for the Giza Plateau. These… two ECF members were Dr. Joseph Schor and Joseph Jahoda. The permit was officially under The Schor Foundation registered in New York. Dr. Schor was also at self-declared Zionists with interest in Israel, and his wife, Laura Schor, was Executive Presiident of Hadassah, the Women Zionist Organization of America. Neither Dr. Schor or Jahoda were archaeologists. Free full time access was given to The Schor Foundation to the Great Sphinx and the Great Pyramid. The official purpose of the project was to ‘find and repair faults and chasms for the protection of tourists’. The true and covert purpose was to search for the ‘Hall of Records’ and conduct ‘experiments’ at the Sphinx and inside the Great Pyramid, expecially in the King’s Chamber and the Relief Chambers. A ‘secret’ two-hours documentary was made of this project covering 1996-8. Copy of this documentary has now been handed to investigators in Egypt in March 2014. My own views on the Edgar Cayce affair: It is no secret that, since 1974, the Edgar Cayce Foundation has implimented a plan, with the help of Hawass and Mark Lehner, to find the Hall of Record and, by extension, bring about the Cayce prohecy of the ‘Second Coming’. Seen from the Cayce viewpoint, this may seem like a noble enterprise, even if it meant that the ‘end justified the means’ so to speak. But seen from an Egyptian, and hence Islamic-Arab viewpoint, it is, to say the least, very different. The involvement of Dr. Schor in 1996-8, a well known Zionist, as well as Christian fundamentalists, make this an even more sensistive issue. Oddly, my book (with Graham Hancock) “Message of the Sphinx” (1996) presents an astronomical theory that, quite inadvertently, seem to add credibility to the 10,500 BC date given by Cayce. So did, of course, the geological finding of Dr. Robert Schoch and John West. This, in a strange and unexpected way, brought us into contact with the ECF in 1995-6. But when Hancock and I discovered the covert mission of The Schor Foundation and Hawass in 1995-6, we exposed it to the Egyptian authorities. The full story will be told in detail in my forthcoming book Secret Chamber Revisted (Inner Tradition, Oct. 2014). It seems that taking up ‘residence’ with generous honoraries is a trend with Zahi Hawass. In 2001 Hawass was appointed “Explorer in Residence” by the NATIONAL GEOGRAPHIC SOCIETY (NGS), with an annual ‘salary’ that ranged from $80,000 to $200,000. This appointment lasted till 2011, afterwhich it was changed to “Explorer in Residence Emeritus”. In 2013 Hawass was appointed “Distinguished Scholar in Residence” at the SIERRA NEVADA COLLEGE (SNC), although the ‘salary’ he receives is not known. After the 2011 Revolution in Egypt Hawass was fired from his post as Minister of Antiquities amid accusations of money laundering, bribery, fraud, corruption and mismanagement of funds. In 2013 it was suddenly announced that Hawass was ‘acquited’ of all these crimes. However, since October 2013 it has been known that Hawass and NGS are being investigated by the US DEPARTMENT OF JUSTICE on possible bribery charges. The investigation is presumably still ongoing. Hawass also may be facing an investigation in Egypt for illegal activities inside the GREAT PYRAMID OF GIZA during the period 2004 and 2006 while he was Director-General of the Giza Plateau. Hawass may also face another possible investigation for his involvement with the EDGAR CAYCE FOUNDATION and some of its senior members and funders from 1977 to 1998. In view of all the conundrum that surrounds Hawass, we may well wonder where next he will take up “residence”, and at what cost. 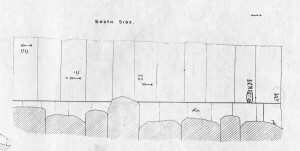 GREAT PYRAMID SCANDAL: The Khufu CARTOUCHE Affair. 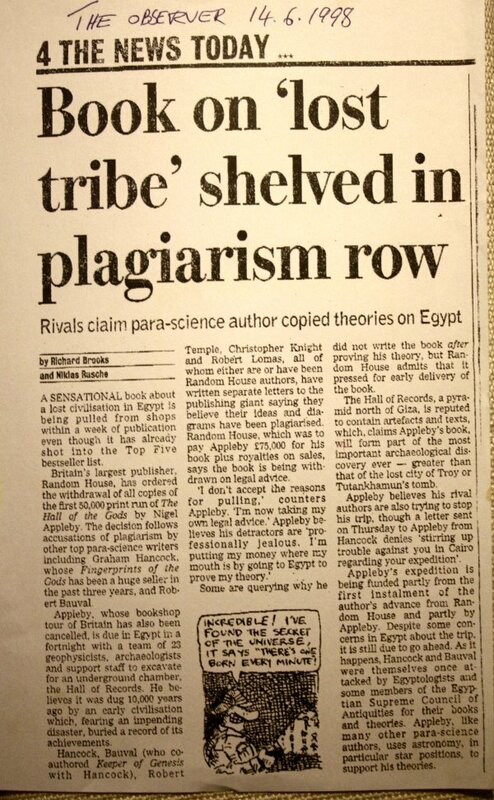 GREAT PYRAMID ‘CARTOUCHE SCANDAL’: Free the PYRAMID SIX APPEAL! GREAT PYRAMID: Who Damaged The Khufu Cartouche? THE CARTOUCHE OF KHUFU: When was it damaged? UNTIL late DECEMBER 2013, as far as I know, NO ONE HAD BEEN AWARE that the Cartouche had been damaged (three or four small white spots on the top rim of the oval). The first person to point out the damage was Egyptologist Monica Hanna in late DECEMBER 2013. So WHEN was the Cartouche damaged? And WHO or WHAT damaged it? 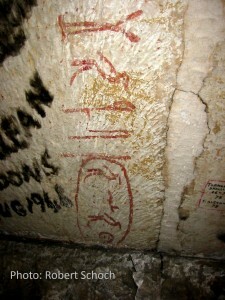 A thorough investigation has produced official photographs and TV documentaries that conclusively PROVE that the Khufu Cartouche was damaged sometime AFTER July 2004 and BEFORE December 2006. (see links to youtubes below) (see also photographs here: http://myblog.robertbauval.co.uk/wp-admin/post.php?post=155&action=edit ) . 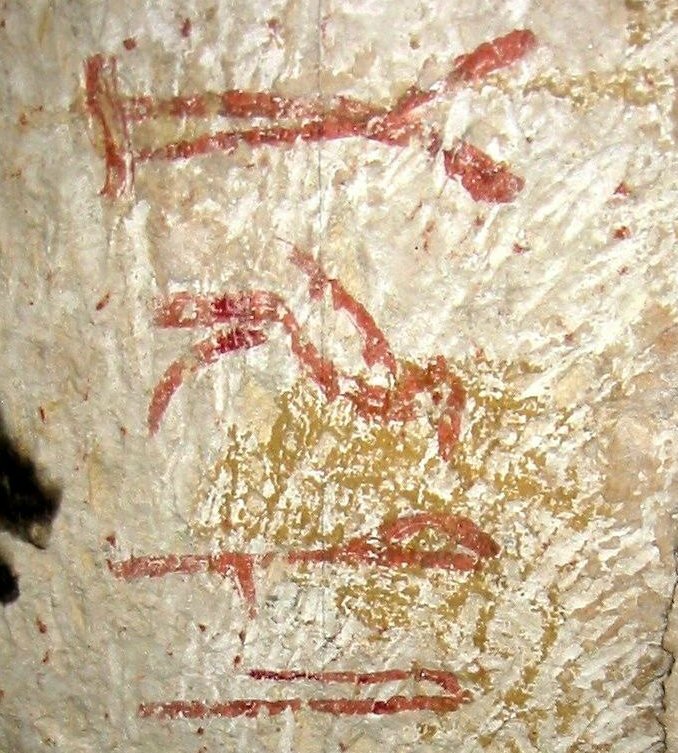 It also proves that Hawass saw and examined the Cartouche in July 2004 BEFORE it was damaged and, later in 2007 and also in 2010 AFTER it was damaged. Since he was the Secretary-General of the Supreme Council of Antiquities and also the General Director of the Giza Pyramids, as well as being dubbed the world expert on the pyramids, he, at least, SHOULD have noticed the damage. Hawass either did not notice the damage or, for reason that we do not know, FAILED to report the damage. Secrets of the Pyramids. Relief Chamber. Zahi Hawass en la Camera descarga en las gran pitamida. Chasing Mummies. S1 EP2: Trapped. This remains to be resolved. But it will not be easy. This is because from July 2004 and December 2006 –more than TWO YEARS— there has been dozens, perhaps even hundreds of permits issued for ‘PRIVATE VISITS” to travel agents and tour operators allowing them to take up to 20 tourists each time inside the Great Pyramid outside normal visiting hours. And although these ‘Private Visit’ permits DO NOT not allow entry into the RELIEF CHAMBERS (the Khufu Cartouche in in the topmost Relief Chamber, it is unfortunately know that many of the tourists did, in fact, access these chambers ! A casual google search will demonstrate this fact. Zahi Hawass has also allowed TV production companies to enter the Relief Chambers during July 2004 and December 2006, although I cannot ascertain how many. POSTSCRIPT: Based on the evidence above, on the 27 March 2014 the MINISTRY OF ANTIQUITIES ordered a NEW INVESTIGATION to determine who/when the Khufu Cartouche was damaged during July 2004 and December 2006. We await the official results. Some pictures with the senoritas fans…. First Hawass, now Ralph Ellis. Has Ellis also gone mad? 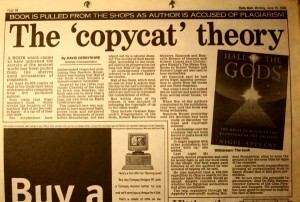 It has come to my attention that you claimed I wrote a book with the notorious plagiarist Nigel Appleby in 1997/8. have you gone mad? This is outrageous and absolutely not true. 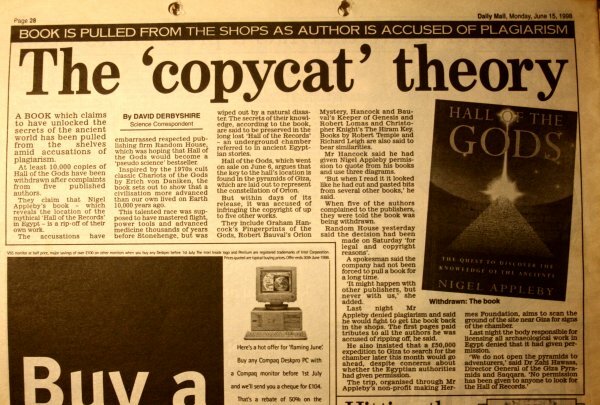 I never wrote ANYTHING with Nigel Appleby. Check your facts before making such false accusations. If you have evidence to back this accusation, then I challenge you to show it here. Otherwise you are well advised to retract it. كشف الدكتور زاهي حواس، وزير الدولة لشؤون الآثار السابق، أن سرقات خرطوش الملك خوفو، تمت لحساب يهودي مصري يعمل في بلجيكا وهو، روبرت بوفال، والذي يحاول بكل الطرق إثبات أن «الهرم صناعة يهودية وغير مصرية». وقال «حواس»، في تصريحات خاصة»، إن محمد إبراهيم، وزير الآثار، قال في أحد اللقاءات الإعلامية، إن «سرقات خرطوش خوفو تمت في عام 2006، وهو ما يخالف الحقيقة والواقع؛ حيث إن الأجهزة الرقابية والشرطة أثبتت أن السرقات تمت عام 2013، وهو ما تثبته جوازات السفر الخاصة بالألمان، والتي ثبت أنهم دخلوا إلى مصر في أبريل الماضي». وتساءل «حواس»: «كيف تكون السرقات تمت عام 2006 والتحقيقات جرت مع المسؤولين الحاليين، ولم يتم التحقيق مع المسؤول عن منطقة الهرم وقتها، كما أن نتيجة التحقيقات جاءت لتؤكد كلامي؛ حيث تم نقل جميع المسؤولين عن منطقة الهرم بعد التأكد من تورطهم في الواقعه بشكل أو بآخر». وأضاف: «أود أن أوضح أن المخربين الأجانب يقودهم يهودي مصري يعيش في بلجيكا، أرسل أكثر من شخص للدخول من قبل وتم منعهم تمامًا، وكانت لي معارك كثيرة معه، كما أنه كتب كتابا من قبل يحاول فيه إثبات عدم مصرية الهرم»، مؤكداً أن «الهرم لم يكن يسمح بدخوله إلا من خلال شركات السياحة، لإحكام السيطرة عليه، وهو عكس ما يحدث الآن؛ ما تسبب في اختراقه وتهريب العينات». وأشار إلى أن «المعامل الألمانية حاولت أن تثبت من خلال اللون الأحمر الموجود في الحجرات أن تاريخ الهرم يرجع إلى 15 ألف سنة؛ مما يعني أن هذا هو تاريخ بناء الهرم، ولكن الحقيقة التي يؤكدها كل علماء المصريات المصريين والأجانب أن (خوفو) أرسل في العام 27 من حكمه بعثة لإحضار اللون الأحمر من الصحراء الغربية من حجر (الماصت) وهو اللون الذي كتب به الخرطوش، وذلك يعبر أن عمر المحجر الذي أحضر منه اللون هو 15 ألف سنة وليس عمر بناء الهرم». وشدد «حواس» على «ضروة نظر المسؤولين عن الآثار لما يحدث من تدمير وتخريب في بعض المناطق وليس مجرد إزاحة التهم عن مسؤول أو محاولة التنصل من مسؤولية مصيبة كبيرة مثل اختراق الهرم، وسرقة خرطوش خوفو، كما يفعل الوزير الحالي». Dr Zahi Hawass, ex Minister of State for Antiquities, revealed that the robberies of King Khufu’s cartouche was done on behalf of, Robert Bauval, an Egyptian Jew working in Belgium, who has been trying by every means to prove that the pyramid is ‘a Jewish and not Egyptian product’. Hawass said in a special statements that Muhamed Ibrahim, the Minister of Antiquities has said in one of his media interviews that Khufu’s cartouche had was stolen in 2006, which is not true, as the inspecting agencies and the police have proved that the robbery took place in 2013, and the the passports of the Germans showed that they entered Egypt last April. Hawass wondered ‘how the theft could have taken place in 2006 while the investigations were conducted with current officials and not those responsible for the pyramid area at the time? While the investigation result came to confirm my words, and all those responsible for the have been removed from the pyramid area after their involvement, one way or the other, has been proven’. 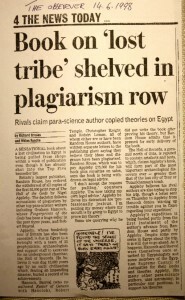 He added: “I would like to make it clear that the foreign vandals are led by (controlled by) an Egyptian Jew living in Belgium, who had previously sent more than one person, who were all forbidden completely, and with whom I have had many battles, and he wrote a book before trying to prove that the pyramid was not Egyptian”. Hawass confirmed that “it was not permitted to enter the pyramid except through tourist companies in order to make control, which is the opposite of what is happing now; which allowed the samples to be smuggled”. He (Hawass) pointed that “the German laboratories attempted to demonstrate, through the red colour found in the rooms, that the pyramid dates to 15 thousand years (ago), which means that this was the time it was built, but the fact which is confirmed by both Egyptian and foreign scientists is that Khufu sent in his Year 27 a mission to bring the red colour from the Western Sahara, from Mast stone in which the cartouche was written, which means that it was the quarry from which the colour was brought who dates 15 thousand years ago and not the pyramid”. He (Hawass) stressed on “the need for those responsible for antiquities to look to what is happening of destruction and vandalism in some areas, not just remove accusations from officials or trying to deny responsibility for a great disaster like breaking into the pyramid and stealing Khufu’s cartouche, as the present minister does”. I wasn’t sure if I should be shocked or amused at Hawass’s insane accusations! It was not the first time, of course, that he had accused me of plotting with ‘Jews’ to ‘undermine Egyptian antiquities’, but this was the epitome of all his bizarre accusations! My first reaction was that he had completely lost his mind! Although I generally ignore this kind of insane bursts from this man, this time I felt that in view of the importance of the Cartouche of Khufu as an historical artifact, I could not let such an accusation go unchecked. There was also the present intense political climate in Egypt to consider. By branding me a ‘Jew’ who masterminded the ‘stealing of the Khufu Cartouche’ might, in these in this already inflamed climate, induce a fanatic to take a pot shot at me. I decided, therefore, to find the two German culprits and demand that they make an official statement that not only I was never involved in their activities, but I also had never had any communication with them in the past! On the 11th December 2013 I placed a private message on Dominique Gorlitz Facebook, and waited. Two days later, on the 13th December, I received a reply. Gorlitz informed me that he was in New York, and was totally shocked to hear about Hawass’s huge defamation against me, and also against himself and his colleague Stefan Erdman. But why was Gorlitz feeling defamed? Was it not the case that he and Erdman had in indeed damaged the Cartouche? Was it possible that Hawass had even lied about that? Surely he would not go that far in his blind hatred toward my person? I would have to look into this matter later. Meanwhile I asked to send me a signed statement confirming that I did not know him or even spoke to him until this day, and that in no way was I involved or connected with him and Stefan Erdman. Gorlitz replied that he would of course be more than glad to give sent me such a statement. The next day, as agreed, Gorlitz e-mailed me a PDF document containing the signed statement. This I immediately sent a letter to the newspaper in Egypt Al Masry El Youm, and included with it Gorlitz’s statement as well as other documents that negated the accusations made against me by Hawass and which their newspaper had published without even bothering to check their veracity. Dear Sir, my name is Robert Bauval. I am an author, and I live in Spain. In your issue of the 10th December 2013 you published an interview by Zahi Hawass in which he accused me of paying two Germans (Dominque Gorlitz and Stefan Erdmann) to steal the cartouche of king Cheops in the Great Pyramid of Giza. He furthermore stated that I am a Jew living in Belgium and that I have written a book that ascribed the construction of the Egyptian pyramids to the Jews. These are outrageous and false accusations. Let me state with the utmost of force that I was not in any way, shape or form involved in the stealing of the Khufu Cartouche by the two Germans. Furthermore I have never met these Germans. I also categorically deny that I am a Jew. I am a Christian Roman Catholic and so were both my parents and grandparents. Furthermore I have never stated in any of my books that it was the Jews who built the Egyptian pyramids. Indeed on the contrary: in my book ‘Breaking the Mirror of Heaven’ I totally condemn the erroneous theory that the Jews built the Egyptian pyramids. 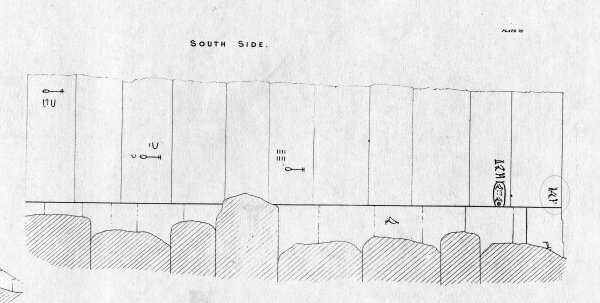 1) A signed letter by Dr. Dominique Gorlitz, one of the Germans who allegedly took the Khufu Cartouche. 3) My baptism certificate as a Christian. ALAN MAIRSON, an American journalist and Member of the NATIONAL GEOGRAPHIC SOCIETY (NGS)., has been ‘silenced’ by legal threat from the lawyers of the NGS. The lawyers have brought pressure on Mairson by calling upon the heavyweight lawyer DAVID HENSLER described as ”the city’s commercial litigator par excellence” and “a 24-carat commercial litigator” and was ranked No. 1 for General Commercial Litigation in Washington, D.C. in Chambers USA: America’s Leading Lawyers for Business Litigation. David is also listed as a leading Commercial Litigator in The Best Lawyers in America and Chambers Global—The World’s Leading Lawyers for Business. That, understandably, was enough to persuade Alan Mairson to close his Website, SOCIETY MATTERS, which acted as a sort of ‘stardards’ watchdog for the NGS and also reported on matters that raised questions on the NGS integrity and mission. One of the big stories that Mairson had been following since 2011 was the unholy alliance between Zahi HAWASS and NGS, especially since the US Department of Justice had opened an investigation regarding alleged bribery between NGS and HAWASS. Mairson correctly pointed out that the appointment of HAWASS in 2001 as ‘Explorer in Residence’ for NGS by Terry Garcia, a vice president of NGS, and the yearly stipend of $200,000 that NGS paid HAWASS put into serious question the connection that HAWASS had with the National Geographic Channel owned in majority by RUPERT MURDOCH’S 21st CENTURY FOX. We recall that it was VOCATIV ( Deep Web Internet News) that first brought to attention this case. VOCATIV is owned by Israeli-American whiz tycoon Mati Kochavi, also owner and CEO of AGT, a ‘homeland security’ and ant-terrorist protection system company working for various governments.